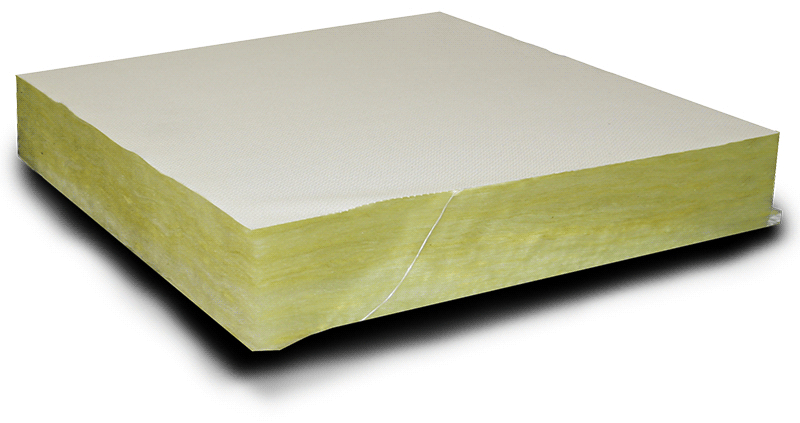 Marine Specifications Industrial Specifications Acoustic Foam is an effective treatment for airborne noise. 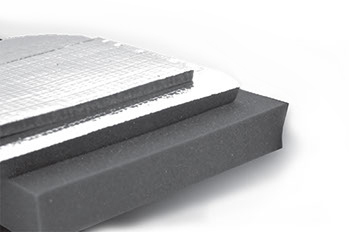 Specifications Industrial Specifications Marine Soundown's Vinyl/Foam Composite insulation combines acoustic absorption and barrier properties to create a comprehensive treatment for engine rooms and machinery enclosures. Specifications Noise transmission between offices, conference spaces, examination rooms, and other work or living areas can be disruptive. One common cause of noise complaints is that noise can travel into drop ceiling spaces and over the top of partition walls. Suspended ceiling tiles are not normally very effective at blocking sound. 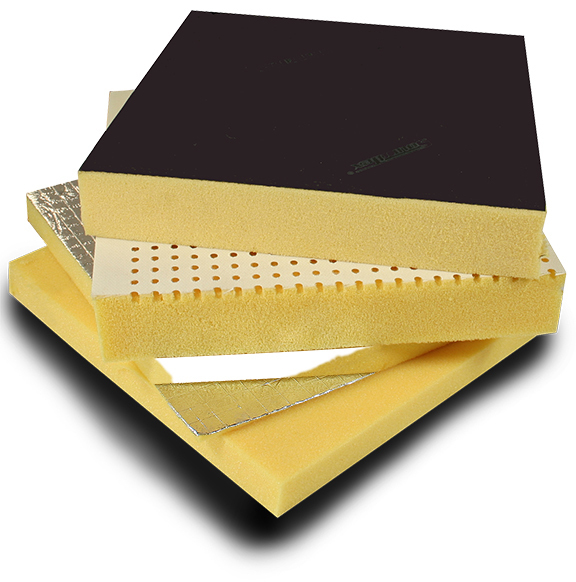 Specifications Soundown's Hull Board is lightweight, semi-rigid, all-purpose acoustic insulation material that also has excellent thermal properties. Hull Board carries US Coast Guard and IMO approvals as an incombustible material, and it is suitable for most areas aboard vessels of any size or service. 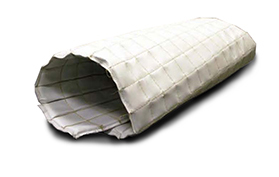 Specifications Incombustible Microlite is specifically developed as a lightweight thermal and acoustic blanket for use in marine applications. Microlite weighs only 0.75lbs/ft3 and provides a large weigh savings when compared to traditional hull insulation materials with weights from 3-8lbs/ft3. Specifications Sylomer® is a foamed, micro-cellular PUR-elastomer that minimizes vibration and structure-borne noise from sources such as railways, highways, MRIs, HVAC, and industrial machines. One or several of the 17 Sylomer durometers are calculated to fit any design and installation. Flexibility to implement full-surface, strip, discrete bearings, or any combination to meet a project requirement, is permitted. 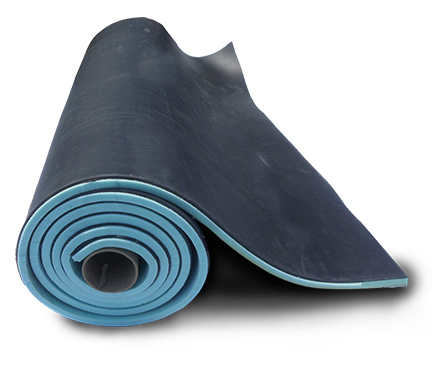 QuietLag is an acoustic wrap barrier for use around ducts and piping of all types. Noise from HVAC units that is carried through ducting is often a source of complaint in home and office settings. Wrapping these ducts with QuietLag will help reduce fan noise as well as voice and other living noises. QuietLag also is effective at treating noise generated by material or fluids travelling through piping systems. Sewage noise, in particular, may be bothersome in homes and offices. Wrapping the pipes with QuietLag will greatly reduce the sudden rushing noise of a toilet flushing or the constant trickle of a shower draining. 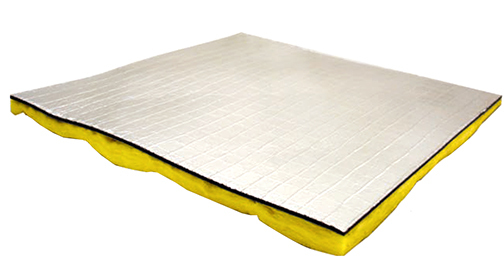 QuietLag consists of a decoupling layer of quilted fiberglass with a 1lb/sqft mass barrier, and it is finished with a metalized rip stop facing. This material comes 4' wide in standard lengths of 12' and 25'. 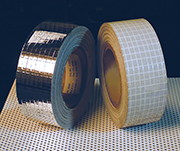 Available matching seam tape allows for easy installation. The Isolation Clip is used in new or existing wall and ceiling constructions to isolate the gypsum board from the framing. Clips are fastened directly to wood, steel, or aluminum studs and are designed to accept standard drywall furring channel. By breaking the mechanical connection between the isolated gypsum board and the other side of the wall or floor assembly, structure-borne noise is prevented from travelling between the two spaces. This has been acoustically tested to add 15 to 20 STC or IIC points to an existing assembly. For the applications with stringent noise requirements, isolation clips should be used in conjunction with Roxul AFB® and TuffMass-UL. The rubber bushing of clips allows for easy screw fastening into wood or metal framing as well as into concrete substrates. With the clips fastened in place, standard drywall furring channel (hat track) is snapped into the clip, and gypsum board is hung using screws per standard practice. 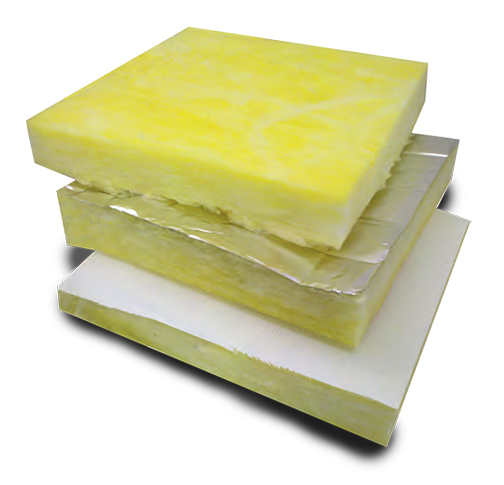 Roxul AFB® is a lightweight semi-rigid batt insulation designed specifically for interior wall and floor applications. 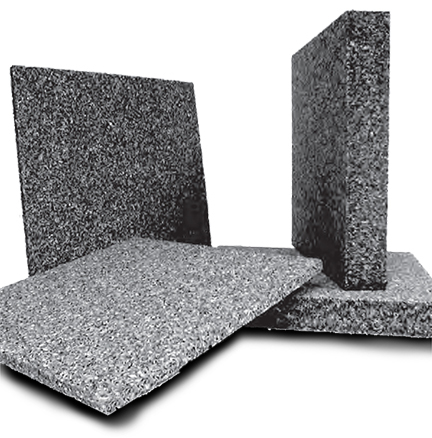 This stonewool-based insulation is made from natural stone and recycled content. It’s a green product that provides superior absorbency and fire protection for overall room occupant comfort and safety. That’s why AFB® is the insulation choice for today’s quieter, greener constructions. 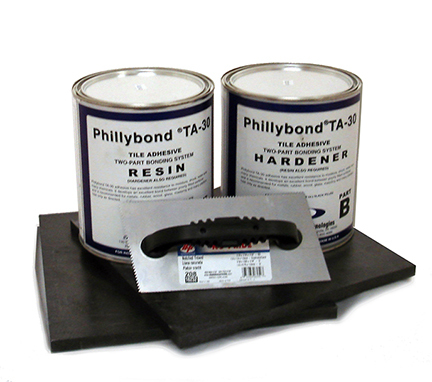 Installation AFB® is easily fit and installed using only a razor knife for cutting. 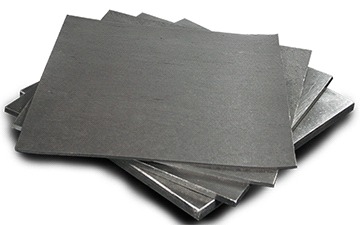 This material’s high density provides superior sag resistance and fit. AFB® is pushed into the cavity between studs and holds its shape during installation and overtime to consistently provide continuous fire protection and sound control. Specifications Rubber Design MP (multipurpose) mounts from Soundown are compact vibration isolators for machinery of all types. 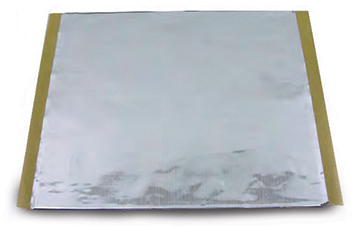 Specifications ATA-30 is a two-component, high tack-strength epoxy adhesive specifically developed for the installation of vibration damping materials, such as Soundown Damping Tiles. Rubber Design TT Mounts from Soundown are designed for applications with high axial loads, such as marine diesel propulsion engines, where the propeller thrust acts directly on the engine. 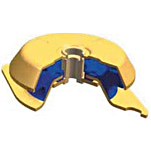 Specifications Soundown Ring Bushing Mounts are high-capacity isolation mounts used to isolate equipment or panels. They feature tow components joined together by a hold-down bolt. The two-part isolation mount is an ideal solution to isolate pumps, motors, A/C units, hydraulic lines, floated interiors, and machinery space finish grids in marine, industrial, and architectural applications, producing a significant reduction in structure-borne noise. MecLev by Rubber Design is Soundown's solution to leveling. When heavy machinery isn't perfectly aligned, or isn't as level as possible, the resulting misalignment generates vibration and noise. MecLevs have the widest configuration options - in height, angle, and load bearing - in the adjustable chock industry. 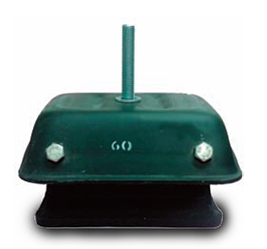 Specifications AMC Marine Mounts from Soundown are used on a wide range of marine- and land-based applications. Their high deflection and high axial stiffness make them ideal for applications where isolation performance must be maintained while an axial load is applied. Specifications TG (Torque Gearbox ) are semi elastic resilient mounts for free-standing gearboxes and/or close-coupled high-speed engines/gearboxes where the mountings have to absorb the torque reaction in combination with full propeller thrust. Specifications Rubber Design TB series Remote Thrust Bearings from Soundown transmit thrust directly to the hull, allowing for a high-deflection engine mounting, resulting in a smooth, quiet ride. 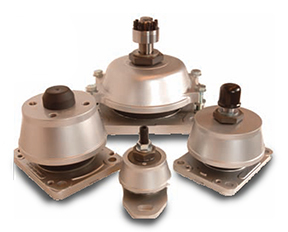 Specifications AMC type BRB mounts from Soundown are versatile vibration isolators that are designed for superior isolation characteristics, especially at lower frequencies. Specifications TR004 is a high-deflection mount that is well-suited to mounting equipment that will need to flex and move. This mount is most often used with generators, AC equipment, electrical switch gear, pumps, and exhaust equipment. 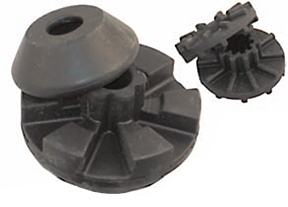 Specifications Rubber Design Conical Mounts from Soundown are designed to provide high deflections with a long service life. In both the vertical and horizontal axes, the transfer function of the mounts is in the range of 12 dB/octave, known as "ideal mass-less spring characteristics." 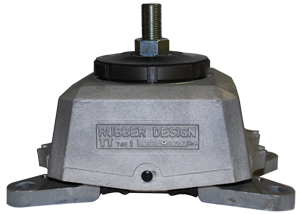 Specifications Rubber Design EPM shock mounts are specifically designed to provide excellent vibration isolation and protection against sudden and dramatic shock. Specifications Cable mounts are a tough, heavy-duty approach to mounting, and are especially appropriate in shock-mounting situations. 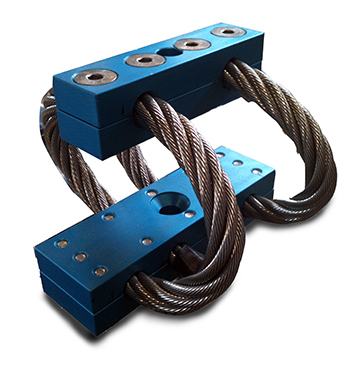 By allowing large displacements, cable mounts increase shock time, thereby reducing force and protecting the equipment. 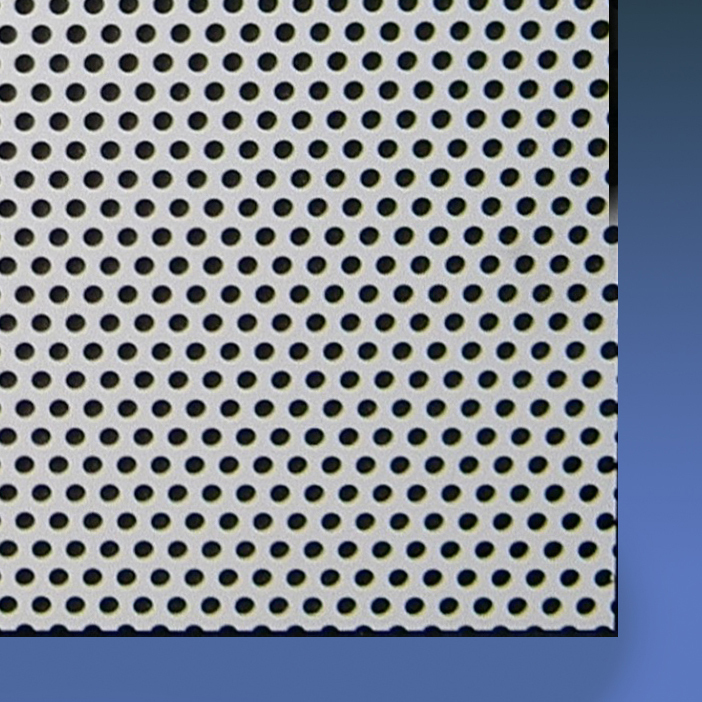 Specifications QuieTech perforated aluminum is a thin, lightweight acoustic absorption panel for use in marine, industrial, and architectural applications. The white, powder-coated finish is attractive, making QuieTech an excellent choice for areas where visual aesthetics are important. Specifications QuietClad panels from Soundown are a damped metal product for use as an acoustic barrier, cladding, or enclosure material. Standard panels are constructed of aluminum and are available with a white polymeric coating or mill finish. Specifications Soundown's Perforated Aluminum provides a bright, durable finish material for installation in engine rooms and machinery enclosures where it is typically installed over the thermal/acoustic insulation. 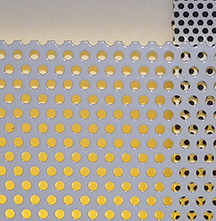 Soundown Perforated Aluminum also can be used as a headliner material. Fixed point stabilizers are a crucial part of an exhaust system. 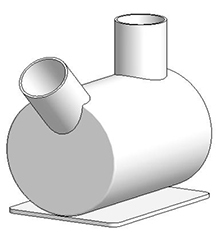 These attach parts of the exhaust flow system to the hull in a flexible arrangement that keeps tubing in place, but transfers minimal vibration. 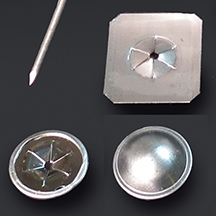 In an effective system, these are laid out mathematically to balance fixed point fasteners. 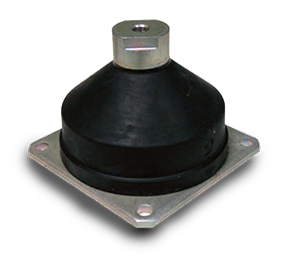 Hanging Fixed Points are vibration isolation mounts for exhaust piping. These mounts are designed to support the pipe from above while isolating vibrational energy in the exhaust system and preventing it from entering the vessel's structure. The Axial WaterDrop incorporates the patented Soundown technology of the classic WaterDrop silencer, only in a configuration that extends the silencer horizontally instead of vertically. Soundown’s Tower Silencers are marine mufflers for use with water-cooled exhaust systems that discharge underwater. Typically used in combination with a Classic or WaterDrop Silencer for the above water bypass, this system provides excellent acoustic performance that can be appreciated both on deck and in the accommodation spaces. Specifications Soundown Classic WaterDrop Silencers are the industry benchmark for quiet, universally configurable mufflers for water-cooled marine exhaust systems. Ideal for propulsion engines and generators, these mufflers are manufactured from glass reinforced plastic (FRP) and carry Lloyds' Register Type approvals. This time-tested silencer solution lifts water from the system and expels it from the vessel. A basic solution, the Waterlift often is combined with other silencers in a silencer system, but it also can be used independently to alleviate some exhaust-related noise for generators or propulsion systems. 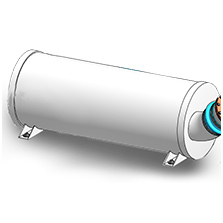 Soundown’s Combi WaterDrop Silencer is a marine wet exhaust muffler designed for use on generators. The Combi packages good acoustic performance in a compact size for applications where low noise is essential and space is at a premium. Specifications A Flying Tower is a variation of Soundown's classic tower silencer. The Flying Tower lies sideways, ideal for configurations where overhead space is at a premium. Soundown manufactures a wide range of exhaust risers, elbows, and spray rings to fit your application. From basic water injected elbows to high lift risers, these are a critical component of any marine exhaust system. Soot sinkers are part of a quality exhaust system. Properly integrated, they remove dirty black soot from exhaust that might otherwise carry it to your deck or the decks of nearby vessels. Rubber Design shaft systems are ideal for heavy-duty shaft-related noise control, employing both active and passive control systems. Components include flexible couplings (a full range of flexible couplings designed to take high thrust and control the transmitted torque), thrust blocks (stand alone and stern-tube integrated), tail and intermediate shafts (manufactured in a range of materials from mild steel to high specification duplex steels), sterntubes, bracket bosses, bearings, stern seals, propellers, rudder stocks, and tubes. These oil bath shafts are ideal if your axle is more than 4" in diameter. 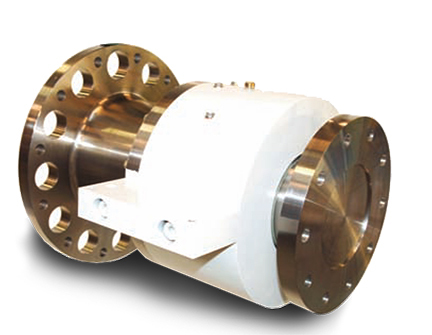 RD Flexible Shaft Couplings are designed to provide flexible connections between a propeller shaft and gear box, compensating for the motion of soft-mounted engines and reducing gear whine. Specifications The Evolution Marine Shaft System (EMSS) is an oil bath shaft designed for smooth, quiet, low-maintenance propeller shaft installation. EMSS's integrated thrust bearing transfers the propeller thrust directly to the hull, which improves efficiency and allows for a softer mounting for smooth, quiet operation. 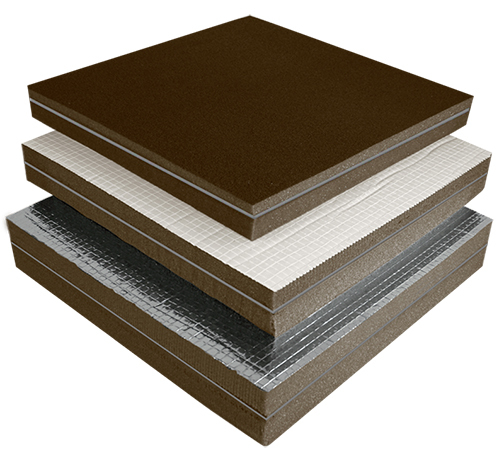 Soundown Head and Hull Liner products provide a bright, clean, and acoustically absorbent interior finish. Specifications Smart-Link by Rubber Design uses rubber torque links with interior cords to adapt to a high degree of displacement. A very flexible coupling results, which makes it specially suited to soft-mounted and more flexible shaft systems. 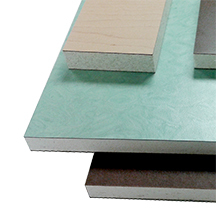 Specifications Fire Resistant Promat's Promarine panels provide both thermal and acoustic insulation. Soundown's line of edge and seam tape is designed to seal Soundown insulation products for a clean, long-lasting installation. Tape styles are available in widths from 2" - 6" and come in a variety of finishes to match your installation. 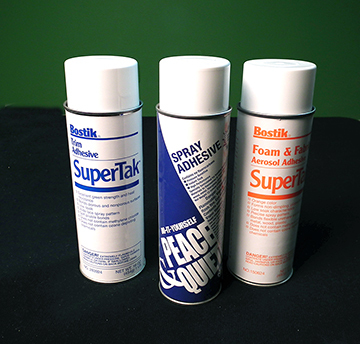 Bostik® SuperTak® aerosol adhesives are top performance adhesives in easy-to-handle and easy-to-store aerosol containers ideal for a variety of industrial applications. Specifications Pins are an essential installation material, typically used to fasten insulation materials to hull interiors and surfaces where a screw isn't practical or possible. Washers keep pin and screw fasteners tightly flush against installed insulation materials, and spread the force of a fastener across more of the material, which prevents tearing of the finish surface. Specifications Gaskets are important for preventing water from filtering through various spaces - they can have the same value for sound that's trying to leak from one space to another. But it has to be the right gasket to be effective. Soundown’s Fiberglass Exhaust Tubing is an important component of any marine exhaust system. 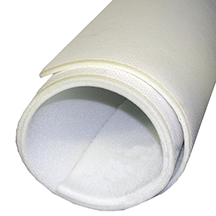 This heavy wall Glass Fiber Reinforced Polyester Resin (FRP) tubing is manufactured with fire retardant vinyl ester resin and carries Lloyds’ Register approval.